Comprised Of or Composed Of: Which One Is Correct? Comprised Of or Composed Of: Which One Is Right? Correct usage: The school comprises six departments. Incorrect usage: Six departments comprise the school. In this example, the school is the whole and departments are the parts.  The group is comprised of students from many different states.  The United States is comprised of 50 states.  The band is comprised of percussion, string and brass instruments.  The group comprises students from many different states.  The United State comprises 50 states.  The band comprises percussion, string and brass instruments. Correct usage: Six departments compose the school. Incorrect usage: The school composes six departments. 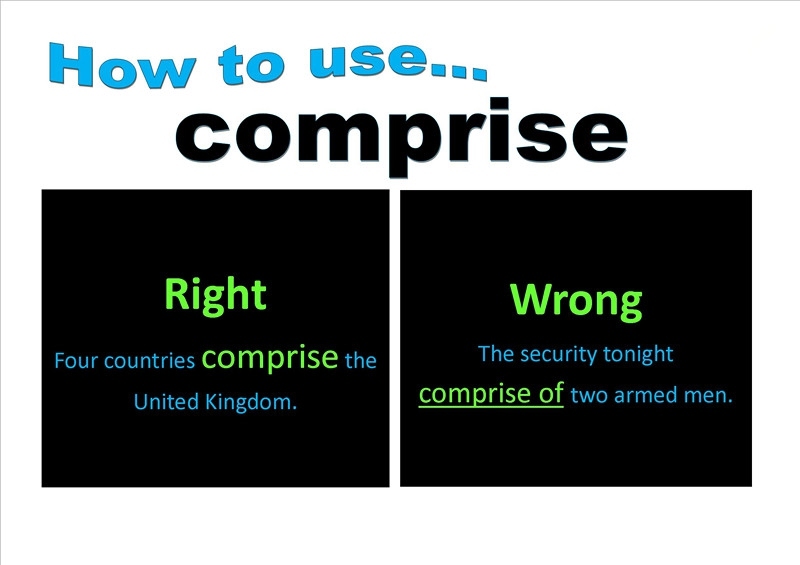 Grammatically, we now understand that “comprised of” is wrong, but “composed of” is correct. However, modern English has moved toward accepting “comprised of.” In 1965, only 54% of the usage panel from The American Heritage Guide to Contemporary Usage and Style accepted the phrase “comprised of.” In 2005, that percentage rose to 65%. Therefore, even though “comprised of” is grammatically incorrect, it is possible that both “comprised of” and “composed of” can be used in sentences. Server responsed at: 04/24/2019 4:41 p.m.